Last month, I flew out to Las Vegas for 3 nights of photography. It had been a long while since I took a trip dedicated to photography! As a new father, my world turned upside down and I found it to be much harder to spend extended time away from home. Every moment is so special and I find it hard to be away to miss even the slightest thing. But being out in the environment and doing photography helps me clear my head and mind when the rush of life overwhelms me. Taking the time to travel and explore is worth it for me. 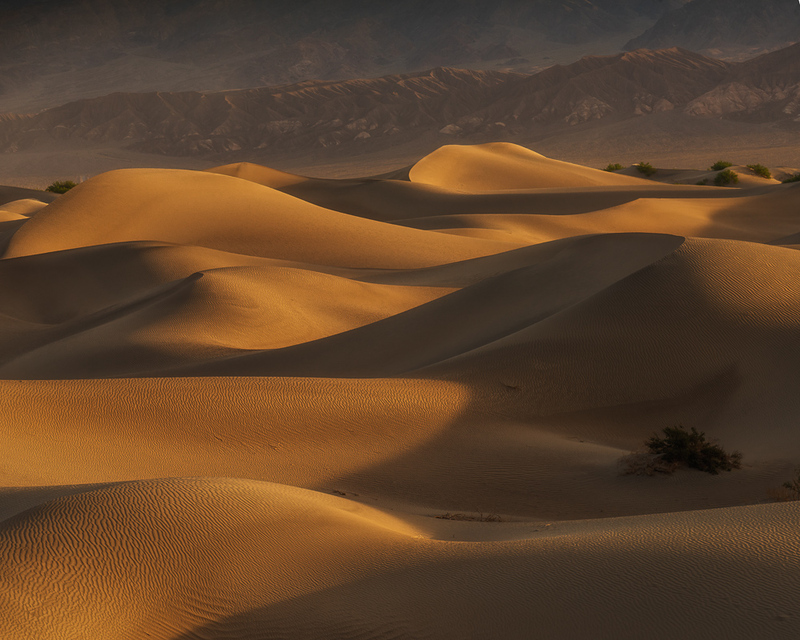 I had considered several locations but settled on Las Vegas and Death Valley National Park. This was because of the really convenient flight out there and the fact that wildflowers were seeing a rare superbloom hadn’t seen for 10+ years. But, a day before I arrived at the park, a massive windstorm swept away the most prominent patches of wildflowers. No worries… I still had myself a great time. I tried to stay flexible and free during my 3.5 days/3 nights in the area. I used a great field guide for Death Valley by Ron Coscorrosa and Sarah Marino that helped me triangulate on locations to hit. Though it was a blast, I think I stretched myself a little too thin and across too many places! I started further east at Death Valley, took a 1.5 day excursion west to the Alabama Hills, and circled back to Death Valley before departing. A lot of driving, a lot of hiking, a few beers, and even fewer hours of sleep — and these are the shots I have to show for it. All in all, it was a really great trip. It helped that I was able to stay in contact, for the most part, with my wife and baby back home. 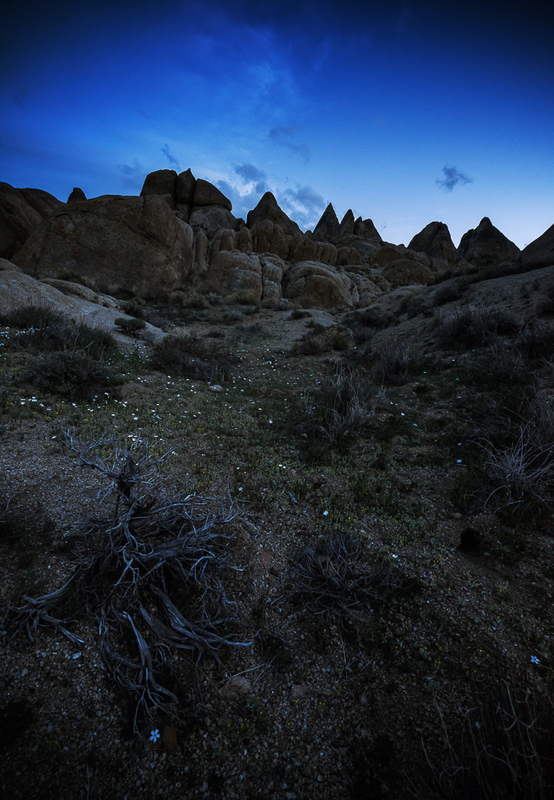 Google hangouts from Alabama Hills – the best of both worlds being in an alien-like, grand landscape but still connected to those I love back home. 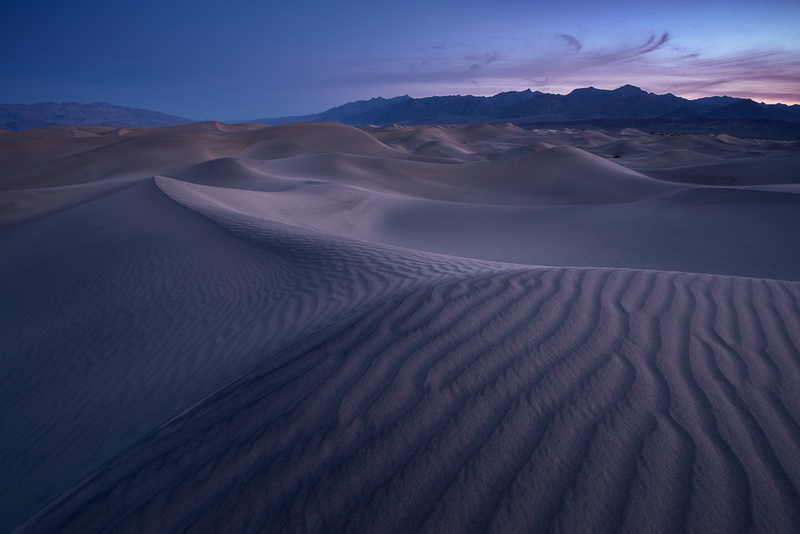 As for Death Valley itself, honestly, the first day or so underwhelmed me. I was wondering what the appeal was of this much-discussed National Park, where mud flats and distant mountains were the most prominent features. However, as I spent more time at the park, its subtleties and more grandiose parts of the environment showed themselves to me. The park itself is massive – so making a rush call on its entirety based on one location and evening was mistake #1. Also, it’s a place for all its scale that is so different from mile to mile. 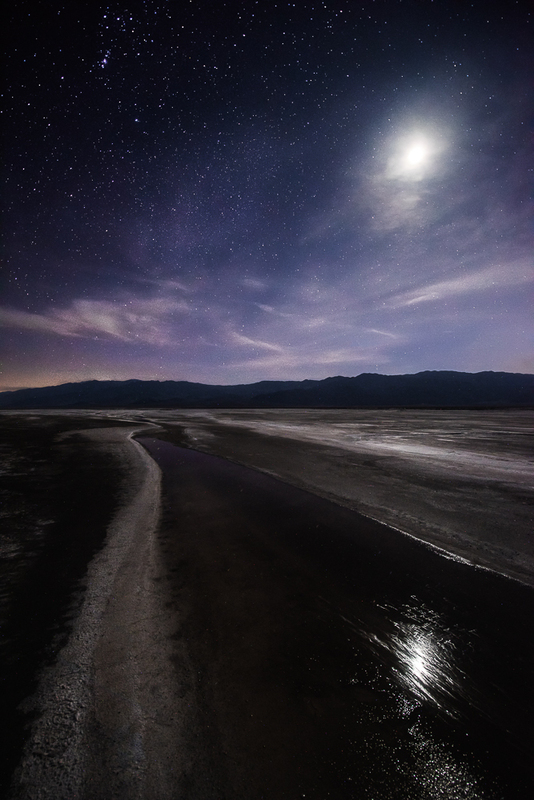 Take for example the Cottonball Basin or Panamint Playa, both of which I spent evenings photographing. As an outsider, I took for granted the formations in the salt and mud playas that were so distinctive in shots I had seen from this place. In truth, finding those photogenic locations is extremely difficult. 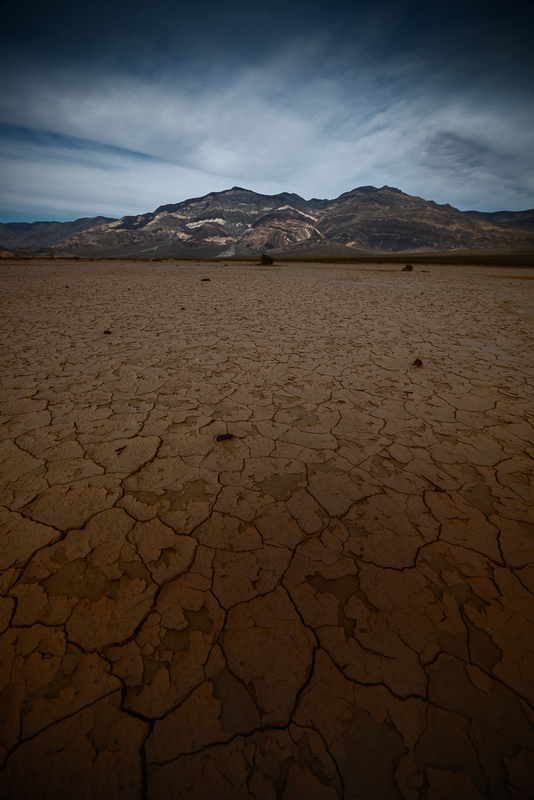 After 5 hours searching on Panamint Playa across several square miles (hiking and by deplacing by car), I found a section I liked but not nearly as deep or graphic in nature as I had sought. It became clear to me that hikers and photographers have spent hours, days, weeks, months combing this park for gems that can be found with time and effort. And finding those gems was not only a photographic accomplishment but a true sight to behold. Just this vignette about Panamint Playa reflects my thoughts on the park — there is so much diversity that can be found in relatively small spaces within this massive area. One really just needs to spend the time to find it. Couldn’t the same lesson be applied in most life situations? Dante’s View: a nice place to see the expanse of a section of the park. 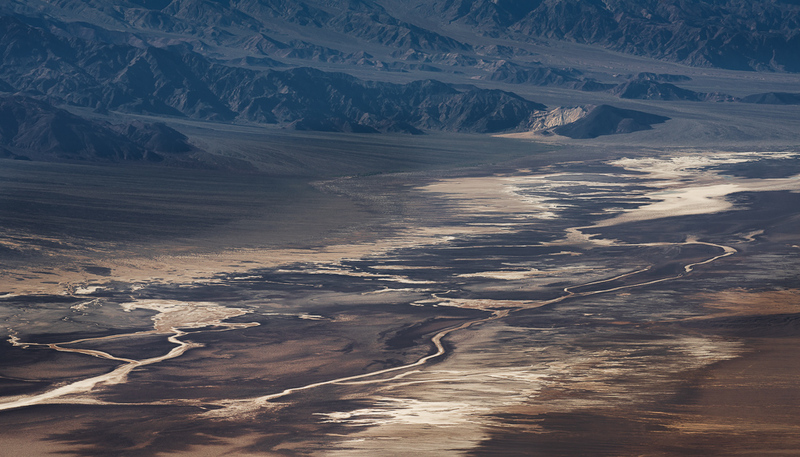 I shot this area in mid-day and was able to see some abstract shapes in the creeks that seep into Badwater Basin. Cottonball Basin: Talk about misunderstanding a place. When I arrived here, I was pretty underwhelmed. I found the edges of this salt flat to be a little boring. A few more minutes in and steps toward center, and the otherworldly nature of this spot took hold. The delicate salt formations were foreboding but fragile. 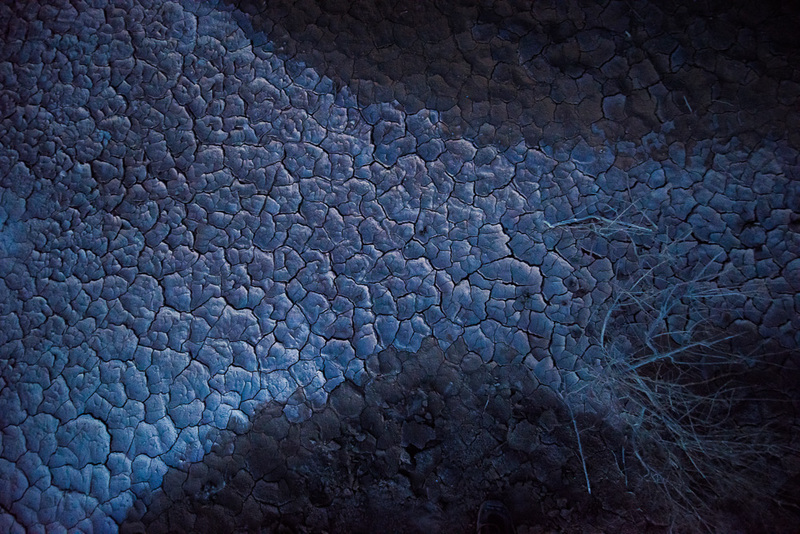 I immediately noticed that my footprints were affecting the crusty surface of the salt flat. Treading lightly, I searched for cool formations that reflected the sunset light. 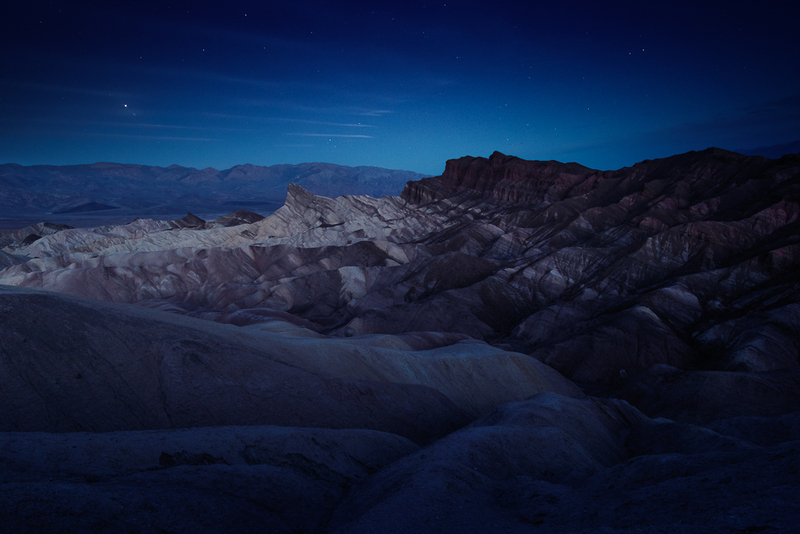 Zabriskie Point: One of the most popular spots in all of Death Valley. I spent some time before sunrise here to capture twilight and some of the waning starlight. Beautiful formations but a little too crowded. Twenty Mule Team Canyon: I found a section of cool badlands in this canyon and set out on foot, deeper and deeper into the canyon. 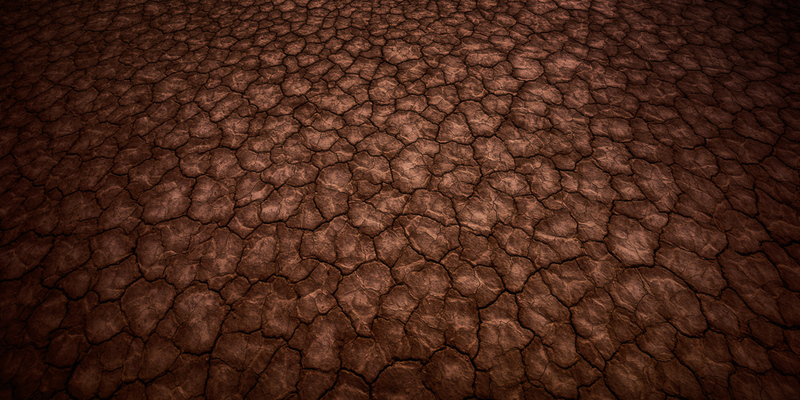 The badlands were interesting in texture — a crumbly sort of mud that fell away as I drove my boots up the mountains. With such a texture, it seemed to me that each mountain of mud existed precariously and could wash away in a rainstorm — kind of reminded me of the quality of Kauai’s Waimea Canyon in the way the oxidized volcanic rock had been reduced to mounds of red ash just crumbling away. 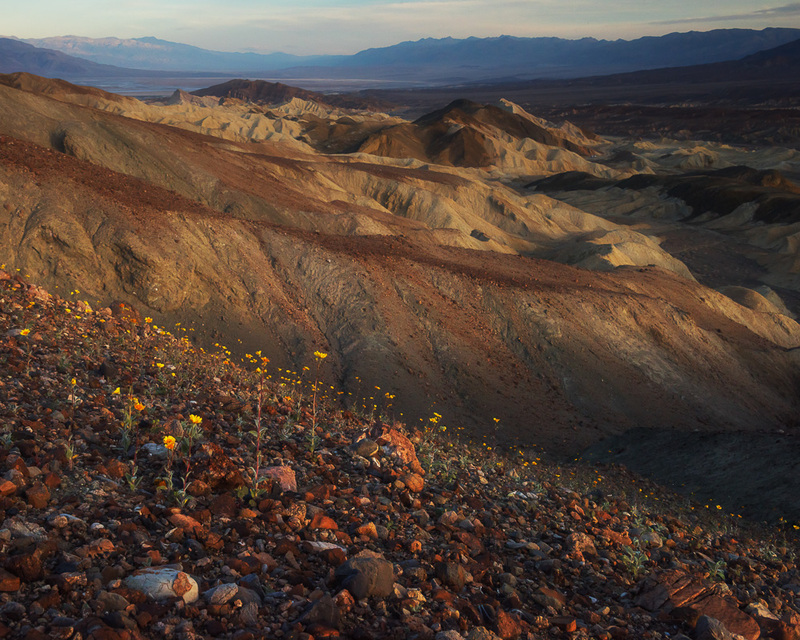 I followed faint footpaths on the edges of the canyon peaks, getting higher in elevation, and suddenly found a rock quarry peppered with desert gold wildflowers. Just past sunrise, it was a perfect complement to the waves of badlands, bathed in warm sunlight, looking towards the valley. 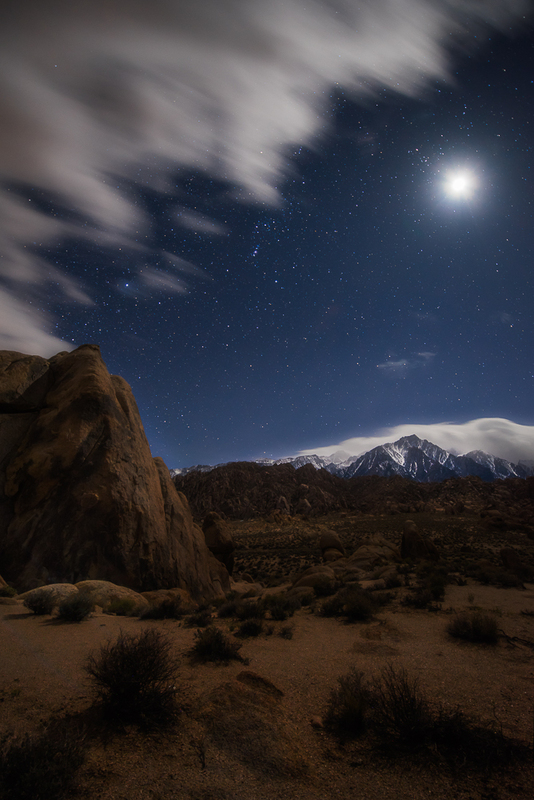 Alabama Hills: I booked it West for 3 hours, past the town of Lone Pine, CA to visit the amazing Alabama Hills. Wow! 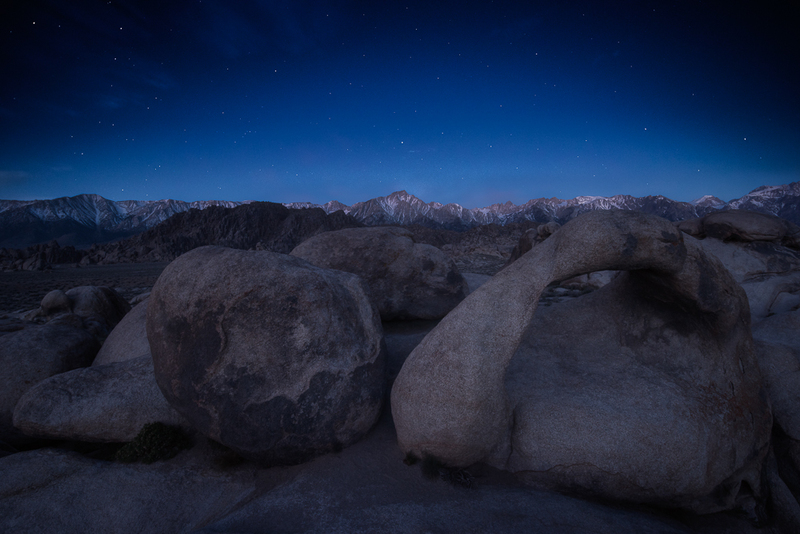 Such crazy formations in rock — varied from those organic shapes close to me in the Alabama Hills, differing to a pillar form closer to the Sierra Nevada Range, and ending with the massive range itself topped by Mount Whitney and still covered in snow. The hike around the hills was just amazing. The ground was covered of loose, soil-like, sepia sand. Within the sand grew tiny flowerbeds of varied colors blue, yellow, green, and white. 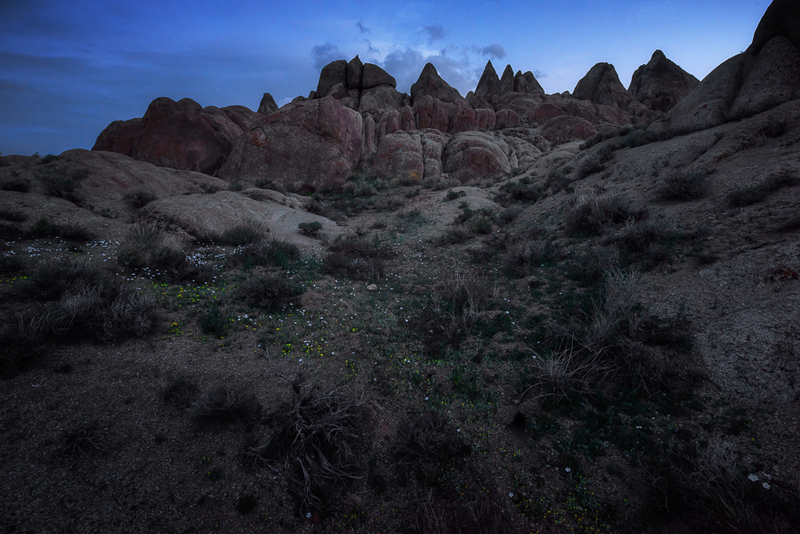 I had to tread lightly to not damage those flowers or the equally frail cacti and other shrubs that hung onto life in Alabama Hills. I did not have the best lighting against the peaks of the Sierra Nevadas, but made do with the view – which was spectacular to say the least. I stayed overnight at a motel (finally – a bed and a shower) and hoped for some better light come morning. No such luck, but the clear skies allowed some continued twilight/starlight photography that I appreciated. 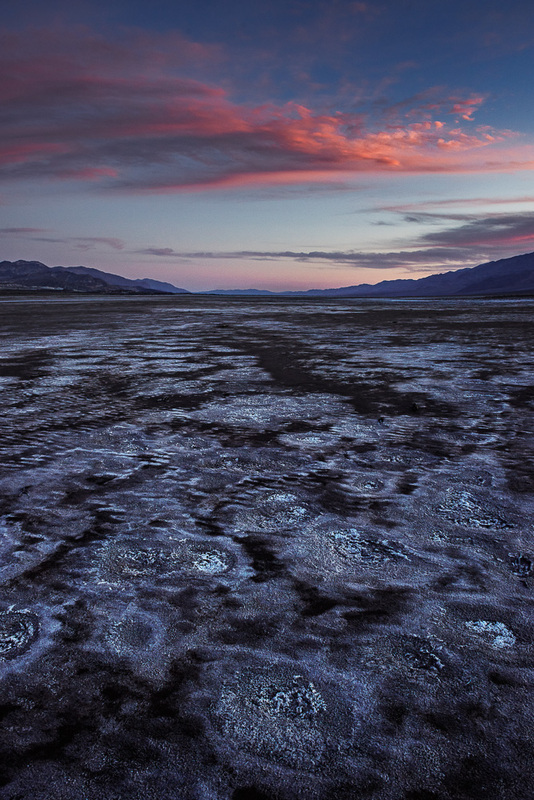 Panamint Playa: Back to Death Valley after sunrise, I decided to stay at one location to maximize the photographic opportunities and spend less time traveling. 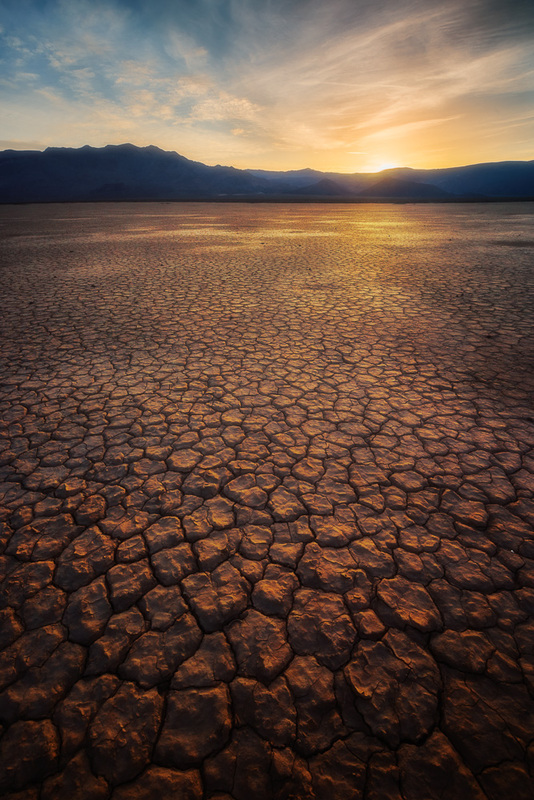 That said, it took a lot of time to scour the playa to find a good composition for sunset. I was determined to find some deep (say 6″ or more) cracks in the mud, but couldn’t find it. 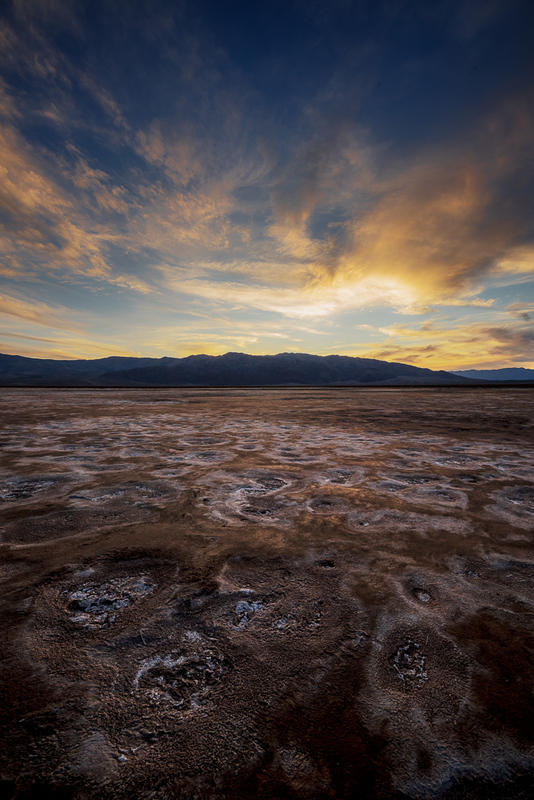 Instead, I found some interesting variations in the color of the cracked mud as it seemed to lead towards the beautiful Panamint Range, with its multicolored sandstone midsection that is so photogenic. The high clouds — that lingered throughout the day and teased me with promises of a colorful sunset — dissipated completely right before the sun started towards the horizon. So, not much color to be had but staying through sunset allowed me some twilight work. 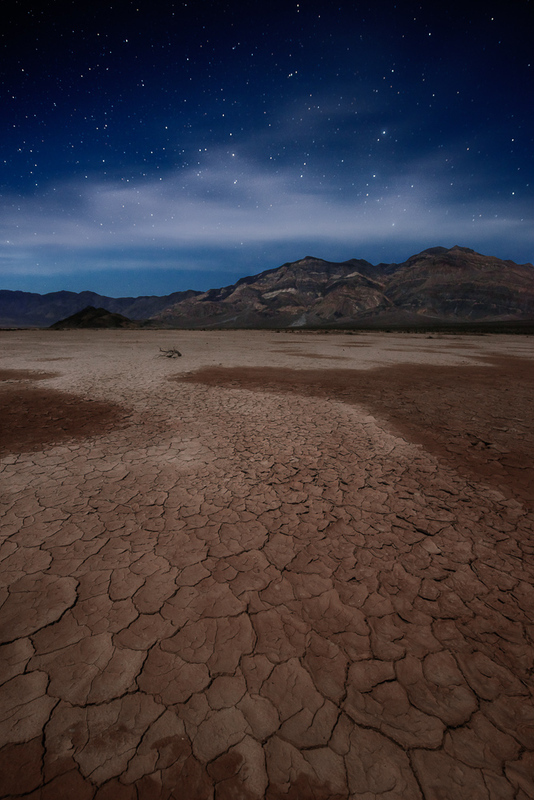 While many photographers cringe at the moon being present for night shots, I used it to help illuminate parts of the foreground and contribute to the blue skies that are lacking at night during moonless evenings. 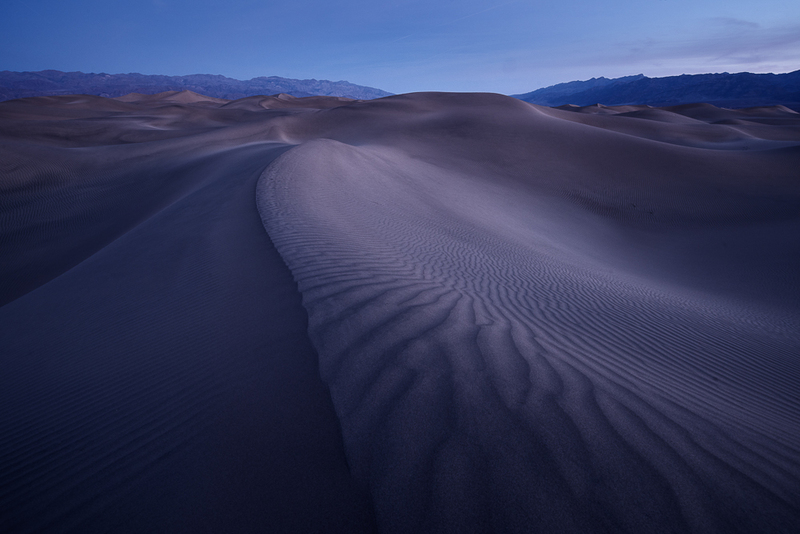 Mesquite Flat Sand Dunes: In September, I got the chance to spend a morning at Great Sand Dunes National Park in Colorado. 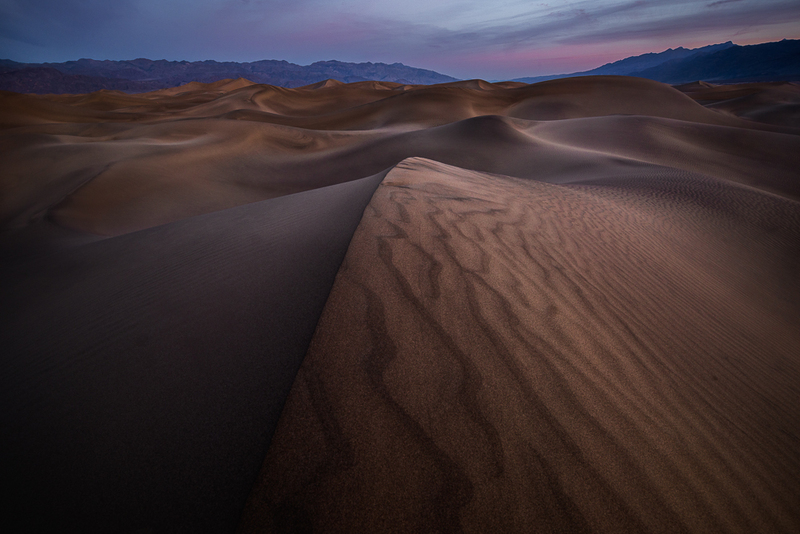 Instantly, I knew that dune photography came very naturally to me, likely because I have been shooting a lot of abstracts lately. 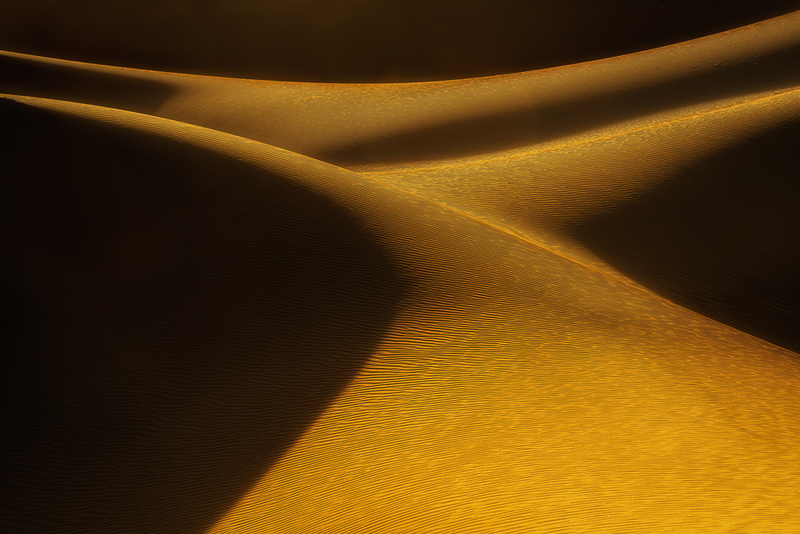 There’s not much better than a rising sun against rolling sand dunes when you love abstract photography. My flight was just near noon, so with not a whole lot of time, I hiked out to Mesquite Flat pre-sunrise and was able to capture a few shots before the fast hike (run) back to the car and onto Vegas. All that done, I still missed my flight home, but all was OK as I made it back just slightly later that evening. This was a strenuous, action-packed, and fun excursion. Not everyone’s idea of a “vacation”, but a cathartic experience for me. I learned some things, as I always try to… in that I do think I covered too much ground with too little time, expending myself too much and perhaps not allowing enough time for mindless exploration and art by osmosis. Also, I reminded myself to COMPARTMENTALIZE when it comes to packing and using gear in the field. When I throw everything together, I can’t find my items as quickly and ultimately lose or forget something. Yes, the light could have been better too, but such is life and I saw some amazing things. I can’t complain. 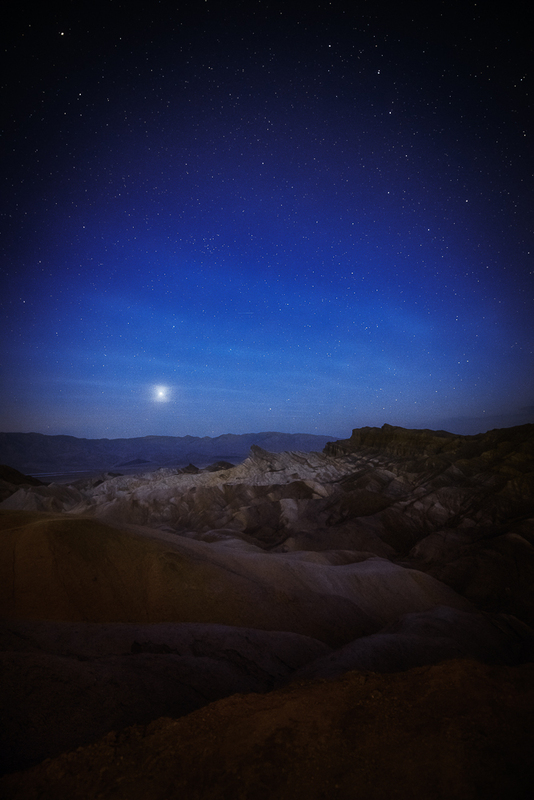 I hope you enjoyed visiting Death Valley and Alabama Hills through my experience and art. Till next time!